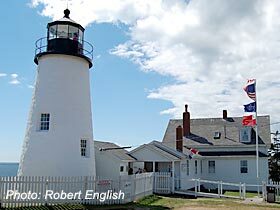 Click map image to open a Google Interactive Map for Pemaquid Point Lighthouse. Pemaquid Point Light (+43° 50' 12.00", -69° 30' 21.00") is located at the southern end of the peninsula that separates Johns Bay and Muscongus Bay. It is a white, conical, stone tower with a black lantern, with a characteristic of flashing white every 6 seconds, and a range of 14 nautical miles. There is no fog signal. Due to the rapid growth of the area’s fishing industry and lumber trade, President John Quincy Adams commissioned the station in 1827 and it was built later that year. The original light was an Argand-Lewis parabolic reflector, which was lit with candles, and showed a fixed white light. It had a range of only 2 miles. The original lighthouse was replaced in 1835. The station received a new fourth-order Fresnel in 1856. (This lens is one of only 6 Fresnels still in use in the state.) The original keeper’s dwelling was replaced by a wood-frame house in 1857. A steam engine operated fog bell and new bell house was added to the station in 1897. In 1899, a striking machine was installed to replace the steam engine. The station was automated in 1934, one of the first lights in Maine to be converted to automatic acetylene gas operation. The Coast Guard removed the fog signal in 1937. By popular vote of Maine residents, Pemaquid Point Light was chosen to be featured on Maine’s commemorative state quarter, the 23rd in the 50 quarter series. An image of Pemaquid Point Lighthouse is also a background option in Windows 7. The popular spot is one of the most frequently visited spots on the Maine coast, attracting more than 100,000 visitors each year. The keeper’s dwelling now serves as The Fishermen’s Museum, which is operated by the Bristol Parks and Recreation Department. The Museum exhibits artifacts of the lighthouse and local maritime history, as well as pictures of all of Maine’s lighthouses. The Museum also displays a fourth-order Fresnel lens from Baker Island Light. A one-bedroom apartment in the dwelling is available for weekly rentals. The tower is open to the public during the summer months. For more information, call 207-677-2494. Pemaquid Point Light is listed on the National Register of Historic Places. 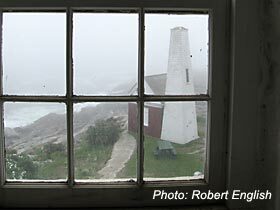 We would like to thank Robert English for granting us permission to use his images of Pemaquid Point Light. 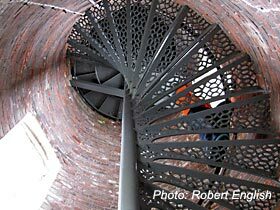 You can view more images of Pemaquid Point Light and Maine Lighthouses by visitng Robert's Flickr page.